Take care of your green lawn envy about the neighbor’s luscious turf down the street. 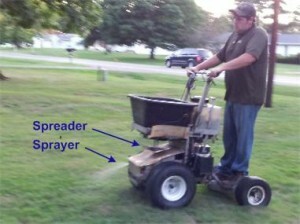 Eliminate those ugly, unsightly and pesky spreading dandelions – Call Dever’s Lawn & Landscape – Contact us — We can help! You can start to address your turf situation right now – step-into our fertilization program and get a big jump towards beautiful lush turf next year. Our full season plan offers a basic four step program with a premium 5th step of lime application for a superior head start on a luscious green turf that we promise will have your neighbors drooling while you relax on the porch or patio in your lawn chair. All our fertilizer and weed control technicians are certified by the Michigan Department of Agriculture as Commercial Pesticide Applicators. This ensures you have experienced professionals with certified safety training when it comes to handling and applying pesticides to your turf. Dever’s specialty turf equipment spreads and sprays at the same time greatly reducing your exposure to pesticides while also reducing labor costs – keeping our prices very competitive. We custom tailor a program that suits your needs and gets rid of those pesky broad leaf weeds; halt crabgrass in its tracks before emergence; and tackle disease and grubs while building thick green turf. Contact us for your free, no-obligation turf review. Call us right now and get a jump on a turf green-up!